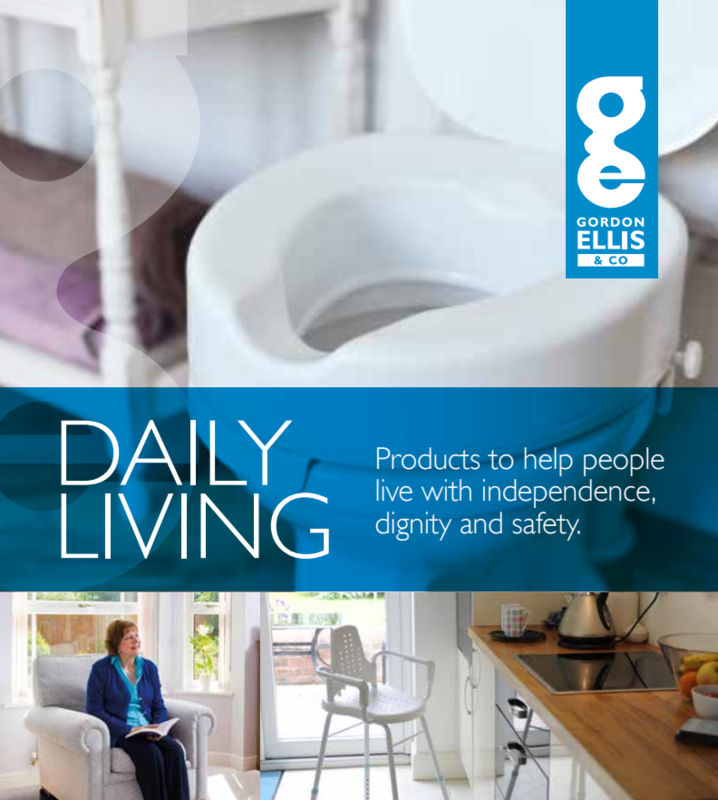 At Gordon Ellis Direct, we believe that everyone should live with independence, dignity and safety. This principle guides all of our product development and service, and we're proud that our small aids for daily living can make a big difference in someone's life. Gordon Ellis Direct is a division of Gordon Ellis & Co, a family business established over 120 years ago. Our award winning products have only been made possible by working closely with professionals and by listening to their feedback. Choosing products from Gordon Ellis assures you of the best possible quality, designed with care and attention. We are inspired by the positive changes we help people make every day, and we hope this product brochure has some new ideas for you too. Our team looks forward to answering any questions you may have. Fraud: By entering the site you confirm that the information provided in this form is true and that you agree to abide by the Terms and Conditions of use of this site. Please note that your order can be cancelled without notice if it is determined that false or misleading information has been provided, the Terms and Conditions of use have been violated, or other abuses have occurred as determined by Gordon Ellis & Co in its sole discretion. If your order has been revoked, Gordon Ellis & Co reserves the right to refuse further orders. Disclaimer. THE INFORMATION FROM OR THROUGH THE SITE ARE PROVIDED "AS-IS," "AS AVAILABLE," AND ALL WARRANTIES, EXPRESS OR IMPLIED, ARE LIMTED TO YOUR LEGAL RIGHTS THE INFORMATION AND SERVICES MAY CONTAIN BUGS, ERRORS, PROBLEMS OR OTHER LIMITATIONS. WE AND OUR AFFILIATED PARTIES HAVE NO LIABILITY WHATSOEVER FOR YOUR USE OF ANY INFORMATION OR SERVICE. IN PARTICULAR, BUT NOT AS A LIMITATION, WE AND OUR AFFILIATED PARTIES ARE NOT LIABLE FOR ANY INDIRECT, SPECIAL, INCIDENTAL OR CONSEQUENTIAL DAMAGES (INCLUDING DAMAGES FOR LOSS OF BUSINESS, LOSS OF PROFITS, LITIGATION, OR THE LIKE), WHETHER BASED ON BREACH OF CONTRACT, BREACH OF WARRANTY, TORT (INCLUDING NEGLIGENCE), PRODUCT LIABILITY OR OTHERWISE, EVEN IF ADVISED OF THE POSSIBILITY OF SUCH DAMAGES. THE NEGATION OF DAMAGES SET FORTH ABOVE ARE FUNDAMENTAL ELEMENTS OF THE BASIS OF THE BARGAIN BETWEEN US. THIS SITE AND THE INFORMATION WOULD NOT BE PROVIDED WITHOUT SUCH LIMITATIONS. NO ADVICE OR INFORMATION, WHETHER ORAL OR WRITTEN, OBTAINED BY YOU FROM US THROUGH THE SITE SHALL CREATE ANY WARRANTY, REPRESENTATION OR GUARANTEE NOT EXPRESSLY STATED IN THIS AGREEMENT. Payments.You represent and warrant that if you are purchasing something from us that (i) any credit card information you supply is true, correct and complete, (i) charges incurred by you will be honored by your credit card company, and (iii) you will pay the charges incurred by you at the posted prices, including any shipping fees and applicable taxes. Submissions All suggestions, ideas, notes, concepts and other information you may from time to time send to us (collectively, "Submissions") shall be deemed and shall remain our sole property and shall not be subject to any obligation of confidence on our part. Without limiting the foregoing, we shall be deemed to own all known and hereafter existing rights of every kind and nature regarding the Submissions and shall be entitled to unrestricted use of the Submissions for any purpose, without compensation to the provider of the Submissions. Due to the nature of our online site, and the products listed, we Gordon Ellis & Co have a strict return policy for all products in line with your statutory rights. Contact Quality Department before returning any goods. Due to the nature of the goods, products will not be accepted for return once used. Please contact us to arrange replacements. 1. If you have bought an item from us online or by post, you have the right to cancel your contract at any time up to seven working days after the day you received the ordered goods. 2. If you decide to return item(s), please inform us by writing or in an email. A phone call can’t be accepted. 3. Please be aware that you have a statutory duty to take reasonable care of the goods and that some goods can’t be returned “by reason of their nature”. For example, this means that for hygiene reasons, products such as those that are worn in the ear (headphones, hearing aids) cannot be returned under Distance Selling Regulations if they have been used. However, we will still refund you if they are faulty. Safe and Sound Products will refund the full price of returned goods. This will include the cost of the original delivery, unless you are only returning part of an order. You will be required to send the goods back at your own cost, unless the goods are faulty. This is not intended to be a full statement of all your rights under the Distance Selling Regulations. Full details are available from your Local Citizens’ Advice Bureau or your Local Authority’s Trading Standards Office. Venue; Applicable Law.YOU AGREE THAT ALL ACTIONS OR PROCEEDINGS ARISING DIRECTLY OR INDIRECTLY OUT OF THIS AGREEMENT, OR YOUR USE OF THE SITE OR ANY SAMPLES OR PRODUCTS OBTAINED BY YOU THROUGH SUCH USE, SHALL BE GOVERENED BY THE LAWS OF ENGLAND. THIS SITE IS CREATED AND CONTROLLED BY GORDON ELLIS & CO.
Verify Members' Address: Gordon Ellis & Co reserves the right to contact a customer via email to verify the accuracy of account information (including the customer's correct name and address) that is needed to provide the customer with the information he or she requested from Gordon Ellis & Co.